This is a follow up to my 2 Daniel Ash – Rare trax compilations and unfortunately a little bit more ramshackle than the previous ones due lack of material. I had about 10 leftovers that haven’t found their places on the first 2 CDs and my first intention was to fill the remaining space with Poptone stuff recorded for WFMU radio session and some Daniel Ash songs from an early Love And Rockets rehearsal but it didn’t work well. So I decided to use remixes for filler tracks instead. Some of them are really intriguing as Daniel tends to add extra backing vocals and/or guitars to his remixes. His backing vocals are very obvious in Modern Day Privateers and Young Americans and there is a very Ash-ish guitar bit in I’m Crazy as well, but I’m not sure about the others. As for the core tracks, there are few real gems here like 2 versions of The Spider Song by The Exit Girls from ’83. This tracks were recorded at Beck Studios during Bauhaus days. Daniel produced the session and also contributed guitars, his bits later appeared in Tones On Tails songs like Burning Skies, Never Never etc. The Spider Song was released on cassette by Northampton Musicians Collective in ’85, however it was a very low-key release and almost impossible to find a copy now. Another rare track is called It’s a Dog’s World which is actually an early longer version of Kid 2000 (later appeared on his 3rd self-titled solo album) without spoken-word by Daniel’s nephew. One song I was pondering about is Demon out. It was floating around the internet about 15 years ago and I’m still not sure if it has anything to do with Daniel. I haven’t found anything about it over the years so any information are welcome. Please note that Watch Me Burn is just a placeholder here, a little excerpt that will be replaced with the final version when “Love, Ecstasy, Terror” (first solo album by Adam Bravin of She Wants Revenge) comes out. We hooked up with Tim when I had released my David J – Live rarities CDs and he sent me his Pulling Arrows remixes. I was blown away and we discussed about a possible release with David. That never happened (yet) but Tim did lots of David J remixes and collaborations over the years, some of them are already released at David’s Patreon site and his new versions for Feel Like Robert Johnson and Ascension are now available on David’s new Vagabond Songs album. He also contributed to (She’s Got) Chinatown In The Rain In Her Eyes from the LP. Track 04 – 07: 2011. Remixes for Memphis Ghosts form Candy On The Cross CD single. Original Memphis Ghosts is a great forgotten gem (with Tony Fitzpatrick’s brilliant poem recited by David) and Tim’s remixes give it justice. Still Dead is my personal favourite of his remixes, bit slower and the most recognizably related to the original. Told Him Everything is a nice transition between Still Dead and New Tattoos which goes more farther from the original while Desoto Bridge is a great dub mix. Track 08 – 09: 2014. Remixes for Eulogy For Jeff Buckley from Not Long For This World album, “one in a sort of Unkle style, a bit like the main Memphis Ghosts one and another in a neo classical style using lots of strings”. Track 10 – 12: 2014-2015. Remixes for Little Miss Impeccable from An Eclipse of Ships album. Track 13: 2015. This is the first mix that released on Patreon (24/07/2015), Vagabond Songs LP contains a slightly different mix. 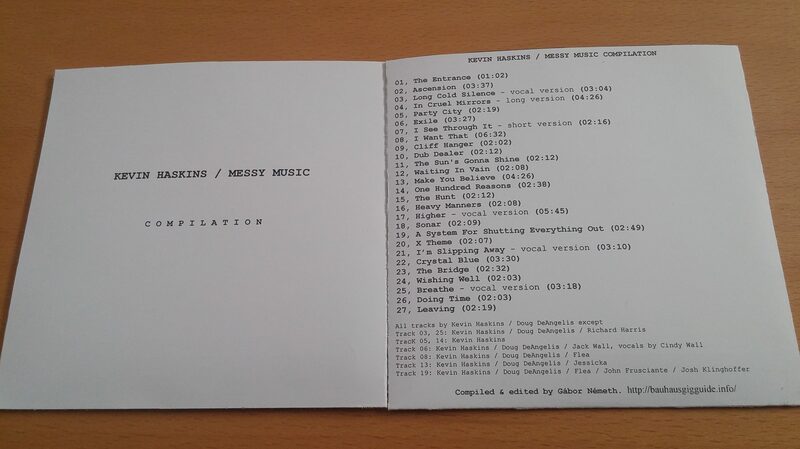 Back in 2014 I did a trade for a rare gem, a licensing sampler/promo CD called Demo selection 2003 that had the incomplete demo version of Robert Johnson. The same incomplete version was streamed on David’s website years ago as part of ‘Tracks from the Attic’ series. I loved that track so I asked David about it. He was kind enough to unearth the full demo for me, and also sent it to Tim to work on it. Tim did wonderful work with it, this track is still my favourite on Vagabond Songs. Track 14: 2015. Tim’s new version for David’s demo that also appeared on Demo selection 2003. Paired with David’s original this new version was released as a b-side of The Day That David Bowie Died 10″ in 2016 and also appeared on Vagabond Songs. 06 – (She’s Got) Chinatown In The Rain In Her Eyes – Year Of The Monkey 3:36. Track 01, 03: 2015. Re-recorded versions for Down In The Tenderloin, yet another song from the great Demo selection 2003 CD. Because of tuning issues with David’s original, Tim decided to re-record it completely. Track 03 is an instrumental version while Track 01 has some YouTube samples of a woman being interviewed in the Tenderloin and placeholder vocals by Tim. Track 02 : 2015. An alternate version / remix for Down In The Tenderloin. Track 04 : 2015. First longer mix of Chinatown. Different shorter mix appeared later on both Patreon (02/08/2016) and Vagabond Songs. Track 05 : 2015. Alternate version / remix for Chinatown. Track 08 : 2016. Full length version of Albino Dog main mix. Shorter version will appear on the upcoming record. Track 09 : 2016. Tim’s unreleased mix for Gimme Some Truth. Track 10 : 2017. Tim’s contribution to David’s 60th birthday present CD called Kanreki! Vocals by Sarah Newman. Demo version of this song was released as a bonus track on the 2006 Plain Records reissue of Crocodile Tears album. Track 11 : 2017. This song just appeared on Patreon (21/08/2017) recently. Piano bits have been transferred from David’s home tapes by me. Additional music by Tim, vocals by David J. You can hear it live on his ongoing Vagabond tour. This is a follow-up to my David J radio sessions compilation CDs including several recent sessions to promote his great upcoming double album Vagabond Songs and few leftovers from An Eclipse of Ships era and a real rarity from 1990. This is a self made collection of Peter Murphy’s digital only releases, contributions and guest appearances from 2001 to 2015. Most of the tracks are available to buy in digital format on Amazon and iTunes. However, there is one yet unreleased track here called ‘Keep Coming Back’ which will be released at some point next year. As the original version is about 10 minutes long with 6+ min. very repetitive (and annoying) intro I have edited it to make it listenable and Sarah Fimm’s ‘Evolution (alt.mix)’ has been added to fill the gap (but I’m not really sure if Peter was involved in that track, one source mentions his name, another not). Here is another compilation I made a few years ago. It contains Ninth era acoustic radio and TV sessions and some live soundboard recordings from the same years. Most of the tracks were recorded by myself from live radio streams or webcasts and I’m sure some of them are still available in their archive. Live recordings were taken from Peter Murphy’s official MySpace and Mark Gemini Thwaite’s Soundcloud sites.